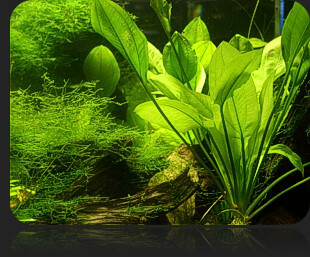 Establishing an aquarium is easy if you understand the nitrogen cycle. The water in which fish live is extremely important to them. It carries their oxygen to them, contributes to metabolic functions and transports away waste products. The water also provides necessary amino acids, vitamins and minerals needed in daily physiological functions. Fish produce waste as a natural part of metabolic functions. These wastes need to be processed; otherwise they will accumulate to dangerous levels in the environment. 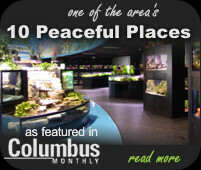 Filtration helps accomplish this in aquariums. Ammonia (NH4) is the primary nitrogenous waste product created by fish. In elevated amounts under certain conditions, ammonia will burn sensitive tissue areas on fish, such as fins and gills. Nitrites (NO2) are another waste product created by fish that is harmful in elevated doses and inhibit oxygen transportation to the bloodstream. Carbon dioxide (CO2) from fish respiration is yet another waste product that can be lethal if not regulated. By properly monitoring and managing the water characteristics through filtrations and aeration, these toxic waste products are prevented from causing harm. Filtration is what allows us to keep fish alive outside their native habitat. It helps clean the water so that the fish can live for extended periods of time without constant maintenance. Aquarium filters accomplish this for us. 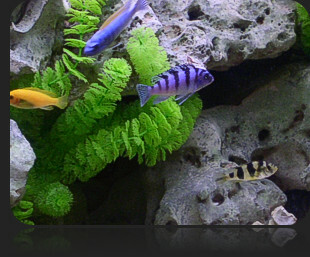 Biological filtration is by far the most important for keeping fish in an aquarium. From the moment fish are introduced into the aquarium, they begin releasing ammonia, their principle waste. If allowed to build, this ammonia can kill fish by burning the gill tissues and preventing them from taking oxygen. Beneficial aerobic (oxygen-loving) bacteria help us filter the water through biological filtration. Essentially, waste laden water passes over bacteria, which consume the waste and convert it into less toxic compounds. Nitrosonas bacteria are traditionally held as the bacteria that are responsible for converting ammonia into compounds called nitrites. The establishment of a healthy reproducing colony of these bacteria takes about 2-3 weeks. Once created in the filter media, these bacteria will instantly change all ammonia present in the water into nitrites. Nitrites, though, are fairly hazardous compounds to fish health as well, so the filter must employ the use of another group of bacteria to adequately filter the water. Nitrobacter or Nitrospira bacteria are held accountable for the conversion of nitrites to nitrates. These bacteria behave in a similar fashion to the Nitrosomonas bacteria in that they will consume nitrites and excrete nitrates as a waste product. Two weeks are generally necessary for these bacteria to fully seat themselves into a filter’s media. Again, once established, these bacteria will instantly change (through an oxidation process) all nitrites present into nitrates. The growth and establishment stages of bacterial colonies are what are referred to as “cycling” the aquarium. In all, it takes 4-6 weeks for the cycling to complete. The amount of bacteria that grow or colonize in the aquarium and filter is dependent on the amount of “food” (waste products) available in the aquarium. However, once complete, the bacterial colonies will continue to reproduce on their own, sustaining themselves on fish waste until the filter is cleaned. It is critical to remember that the media involved house billions of living bacteria, and the presence of these bacteria is what keeps your fish healthy and thus the absence of these bacteria can result in the loss of all other living organisms in the aquarium. 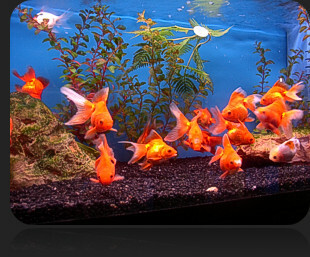 When it becomes necessary to clean the filter media, usage of the aquarium water to rinse the media is essential. If the media is instead rinsed with chlorinated tap water, these important bacteria will be killed and the fish’s toxic waste will not be removed. Ideally, the rest of the tank is left untouched when cleaning biological media, for it too houses bacteria, and they will help pick up the slack when the main component of bacteria are under stress from cleaning. 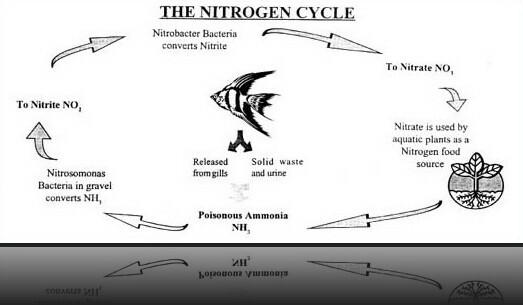 Nitrate, the final end product (NO3) derived from nitrite (NO2) in the nitrogen cycle is not harmful to your fish. However, one problem which can develop from high levels of nitrate is excessive algae growth. High levels of nitrate act like fertilizer, producing a carpet of algae on the tank floor and walls. 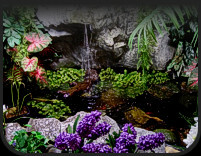 Live plants in an aquarium will feed on this fertilizer, helping to reduce nitrate levels and thus reduce algae growth. Home test kits should be used to monitor ammonia, nitrite, pH, Nitrate and other water quality conditions at the beginning and through the life of your aquarium. Your Aquarium Adventure Fish Specialist can show you how to test the water. Once your tank is established (after five weeks), then partial water exchanges should be done every 2 to 3 weeks, never more than 1/3 of the water at a time. An established aquarium, one operating 6 months or more, will also need to have its gravel siphoned occasionally to free solid wastes from the bottom of the aquarium.